It’s about 2 weeks until Christmas and as it’s still quite warm in London I can’t say that I have really got into the Christmas Spirit yet. I therefore decided to make some Christmas Granola, which I invented as I found a German Spice mix for German Christmas Gingerbread “Lebkuchen”. Unfortunately, I don’t really have the time to make the classic Lebkuchen this year but I did want to use the spices in some way that I could feature on this blog… and homemade granola is another of my brunch favourites, so there we are! The Spice mix I used contained Cinnamon, Cloves, Ginger, Nutmeg, Star Anise, Cardamom and Coriander seeds. I’m pretty sure you can get similar spice mixes out of Germany as well but if not, then there’s are some online recipes for “German Christmas Spice Mixes”. Having looked at a few of them, it seems that you can basically mix any of the usual “Christmas Spices” in ground form as long as you use smaller quantities of the stronger/spicier ones. If you want an actual recipe, one option I found is a combination of 35g ground cinnamon, 9g ground cloves, 2g each of ground coriander seeds, ground ginger, ground cardamom and ground nutmeg. The granola itself is based on one I found on one of my favourite blogs by food photographer Valerie Rizzo: Eating Brooklyn. I particularly like this recipe as it is for toasted granola as opposed to the more common oven baked one. Toasting the oats, seeds and nuts filled my kitchen with a bit of a fire roasting smell which, combined with the Christmas spices, did make me feel a little more Christmassy… that and “Elf” being shown on TV, as I was making it! Mix the oats with the sunflower seeds in one bowl. Chop or crush the nuts into rough pieces. You can either do this by putting all the nuts in a food bag and bashing the bag with a rolling pin or by chopping them up roughly on a big chopping board with a big knife. If you do the later, keep the nuts separately as pecans and cashews are much quicker chopped up than almonds. Mix the cinnamon with the other spices in a small bowl. The oat & sunflower seed mix, as well as all the nuts now need to be toasted. As it’s quite a large amount of oats and nuts the toasting needs to be done in batches. I always start with about 3 batches of the oat & sunflower seed mix by heating a non-stick frying pan over a medium-high heat and spreading a thin layer of the oats & seeds in the pan. They need constant stirring so nothing burns – you are aiming for an even golden colour. 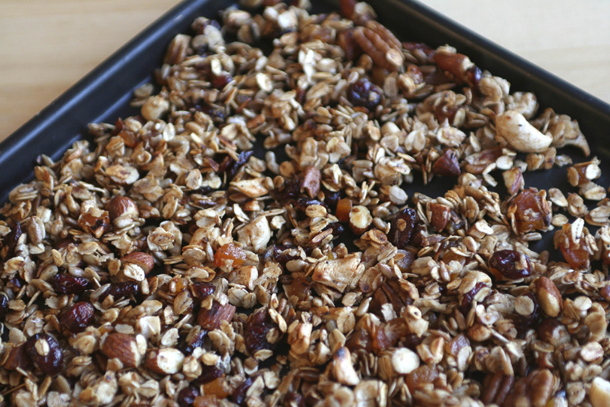 Once the first lot is done, set the toasted batch aside in a big bowl and mix with a teaspoon worth of the spice mix, while the granola is still warm. Continue this until all the oat & seeds as well as the nuts have been toasted and the spices are mixed in (if any spice mix is left at the end, just stir it all in then). Stir in the cranberries and apricot pieces. Finally pour in the maple syrup and oil and mix everything well with a metal spoon, then spread the granola on 2 baking trays to cool down. After an hour or so, it should be cold and can then be kept in an airtight container for up to 2 weeks. 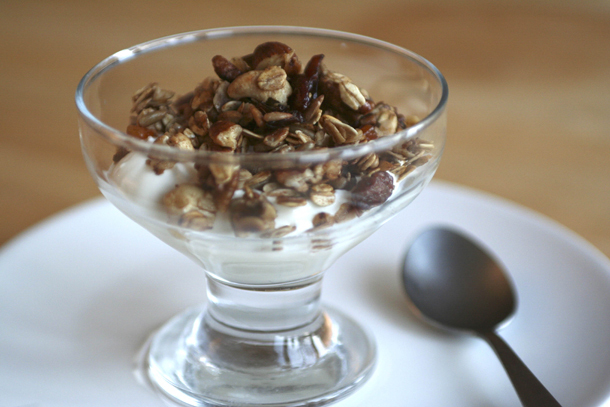 Serve however you like your granola, probably with some Greek yoghurt and fresh fruit. This entry was posted in Other and tagged apricots, breakfast, brunch, cinnamon, delicious, easy, easy recipe, quick recipe, recipe, recipe with oats, tasty. Bookmark the permalink.